Welcome to our website. 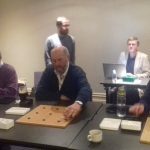 The Irish Go Association is the official organisation for promotion of the ancient oriental game of Go in Ireland. 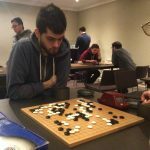 We are members of the European Go Federation and the International Go Federation, and organise numerous club and tournament events throughout the year. The IGA promotes awareness of the game including teaching sessions and providing public infomation. Please read further here for details of member benefits and our activities. There will be a one day tournament in Belfast on Saturday September 29th. Normally we go to Cutter’s Wharf for lunch, and in the evening possibly to the brewbot or some restaurant for post tournament festivities. In something of a surprise, Cian Synnott took an early lead in the Top 8 this weekend. The event took place at the Clayton Hotel, Ballsbridge, with Noel working his usual magic in arranging the venue. Cian scored 4 wins over 3 former champions: Noel, James, and Stephen, and against newcomer John Courtney. Finishing on 3 wins were Belfast players James and Tibi. Full results are here. The tournament continues! Tibi posted photos on facebook. Ireland finished off their PGETC season with a draw against Belarus. That left us in 6th place in League D. With some additional manpower we our prospects for finishing higher up the table, and even for promotion, should be brighter. The team for this year was: James Hutchinson, John Gibson, Tiberiu Gociu, Eoghan Barry, Cian Synnott (C), Kevin Farrell. Kevin appears to have been the star of the season with 6 wins out of 7. The competition in the 39th World Amateur Go Championships started today. You can follow the action via Ranka, which is providing excellent coverage this year. Game reviews, player interviews, and round reports are all available. If you wake up very early in the morning, you can also follow a Live Stream of play. Ireland is represented by Michael Thai this year. The event was won by Yi-Tien Chan (7-dan) of Taiwan. 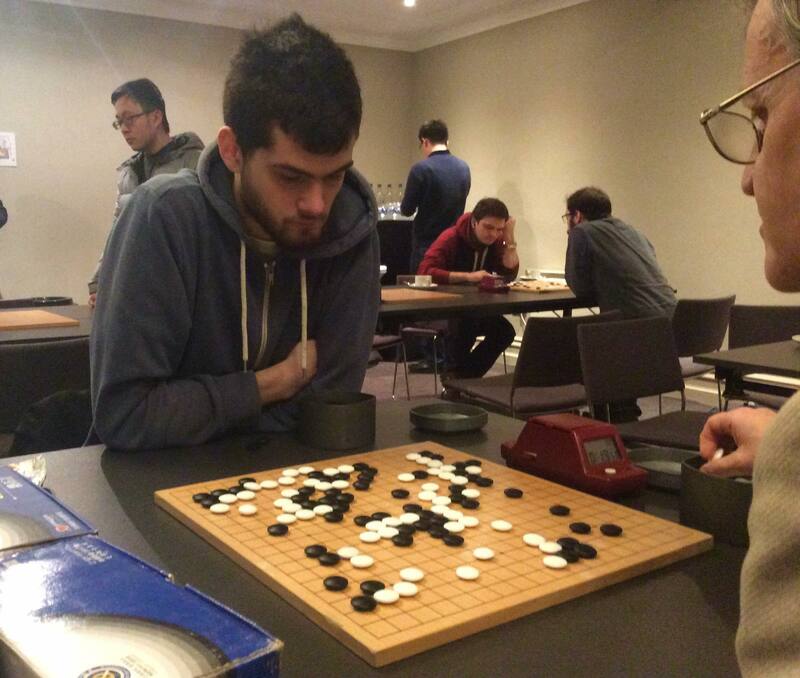 Michael did well to pick up 3 wins out of 8, beating Azerbaijan, Bulgaria, and Chile (The ABC of Go) for a respectable 48th place. Stanislaw Freljak of Poland was the top placed European in 4th place. You can see a few photos of Michael in action if you browse through the picture gallery. For the ordinary player, the Confucius Cup is normally the highlight of the year’s competition calendar. Unfortunately this year we were the target of the disruptive storm Emma. The early forecasts suggested that we would be able to carry on as normal, but by Thursday all the airports had shut down, roads and railways became impassable, and a Red Alert was put in place countrywide by Met Eirann. 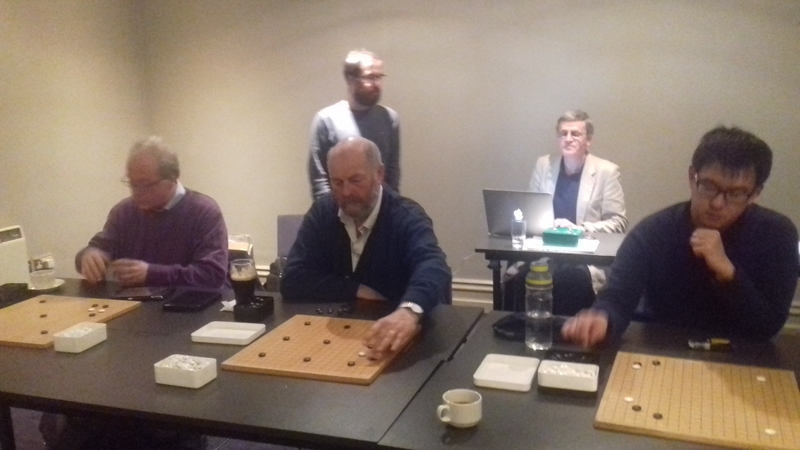 As a result the Irish Rapid was cancelled and the Confucius Cup was only able to run in a reduced format. 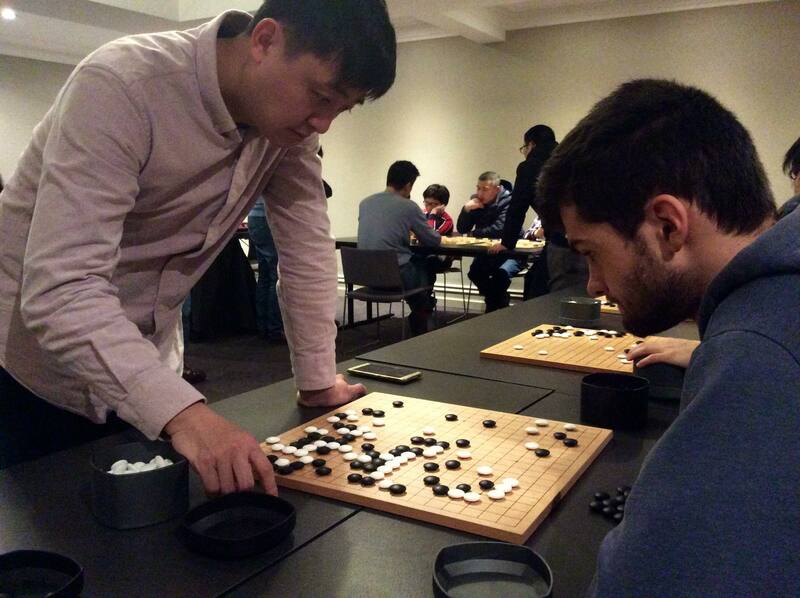 As usual, the Xiangqi competition ran alongside the Go, but it too was run in a reduced format. The Annual General Meeting was planned to take place during the event, but it too had to be cancelled given the weather. Beyond that, the hard work of Prof. Liming Wang and the Confucius Institute in securing invites for professional players and special guests from China did not go amiss. 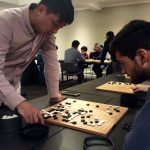 Liu Shizhen (7-pro) and Chen Tianhui (6-dan) were both too strong to be stopped by a closed airport. They arrived and entertained with simultaneous games and teaching. Thanks go out to the organisers John Gibson, Arthur Cater, Carol Doyle, and referee Tony Atkins. Due to ongoing extreme weather conditions the decision has been taken to cancel the Irish Rapid on Friday night. Travel, even in Dublin itself, is very difficult. A RED weather warning remains in place today. Regarding Saturday and Sunday. The Confucius Cup will no longer be an EGF Grand Prix event, it will still take place, but in a reduced format. More information will be posted when we have it. The IGA can only offer its apologies to everyone who hoped to enjoy the weekend in these circumstances. The final game of the 2017 championship cycle was completed just at the end of February. Philippe Renaut managed to take the title out to Galway after a hard fight with Noel Mitchell on KGS. The weather is always a good course of conversation in Ireland, and it seems that the Confucius Cup will be no exception to that. According to Met Eirann Ireland is going to share in the cold weather that the rest of Europe has been experiencing. Please be prepared for cold temperatures and perhaps some snow. As of Thursday 3rd March there are severe disruptions to flights. You can follow Dublin Airport on twitter or facebook to keep up to date. However the best source of information is usually your own airline. As of 18:00 1st March the event is still scheduled to go ahead with a reduced field.